Last summer as we were traveling in Europe and well prepared for sun protection, we found ourselves on the way to the amazing city of Salamanca. However before we got there from Toledo in Spain, we made a stop for lunch and visited the ancient walls of St. Teresa's town of Avila. This town was walled off in the ancient times and it looks like a giant castle as you approach the area. It was amazing to see how these walls have passed the test of time. Of course in the midst of summer time, the heat was almost unbearable. 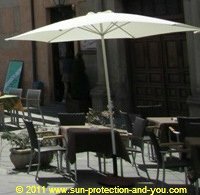 Not only did we have our handy sun protection umbrella in hand, but we also noticed that the whole street was filled with Sun Protection Umbrella too! This was a no brainer for the cafes and restaurants. Otherwise they would have no customers sitting down in that heat. Good job Avila, keep practicing sun protection and perhaps save the lives of the tourists as well.